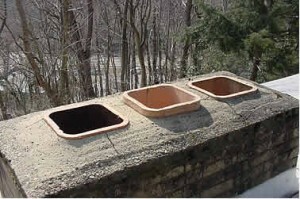 A chimney is often one of the most neglected components of a home or business. Normally you cannot see the top of the chimney to notice any damage that may have occurred over the years. The top of the chimney is called the crown. In this photo you can see that the crown is cracking. This cracking allows rain and melted snow to seep in and when it freezes, the ice expands and cracks the crown even more, resulting in further damage. Eventually the entire crown will become loose and water will seep down into the chimney. As the cracks widen, water may even begin to damage the drywall in the home. The crown may also implode and come crashing down inside the chimney. We have a special process of repairing these damaged chimney crowns that can save you thousands of dollars in repair bills and avoid totally rebuilding the crown. Most chimney crowns can be repaired instead of being replaced which results in a substantial cost savings to you. Our chimney crown repair specialists will inspect the crown, chimney and flues for damage and recommend any necessary chimney crown repair and sealing. Our chimney crown repair professionals will apply a special coating over the existing crown to prevent any leaking and further erosion. A little preventive intervention can help avoid costly damage and high repair bills. Call A All Animal Control today for more information on how we can help you with all your chimney crown repair and sealing needs.